Finnish Prime Minister Juha Sipila says his coalition can no longer go on with the Eurosceptic Finns party, after it elected an anti-immigration hardliner as leader. Jussi Halla-aho has been convicted of hate speech for anti-Islamic and anti-Somali comments on his blog. His two partners in the ruling coalition said conditions were not right to work with the nationalists. Opposition parties want a snap election but that is not expected at this stage. The three-party coalition came to power in 2015, bringing the Finns into government for the first time as the second biggest party. 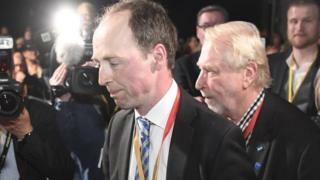 The Finns have seen their support flagging in recent months and picked Jussi Halla-aho as new leader at a party congress at the weekend. He immediately called for a "more aggressive" approach to its policies on the EU and immigration. In a Facebook post on Monday, he complained that Mr Sipila would not agree to a harder stance on immigration policy. The prime minister told a news conference that the two remaining coalition parties had little in common with Mr Halla-aho's party. "We already had to stretch our common values to the extreme, and now the differences in values are even bigger," he told reporters. His National Coalition Party ally, Finance Minister Petteri Orpo, said the Finns leader's policies were difficult to accept. The two parties have begun looking for a new partner to join the government, although opposition parties have indicated they want early elections.